It's available on most ICE routes, but not all. Cost wise there it's 4,95€ a day in standard class, though there's a small number of roaming partners with whom you can get online in standard class too (mostly T-Mobile Germany though). It used to be paid-for in first class as well, but as of late 2014, it's now free for first class customers (matching what most other European high speed operators do for their wifi). Not the answer you're looking for? 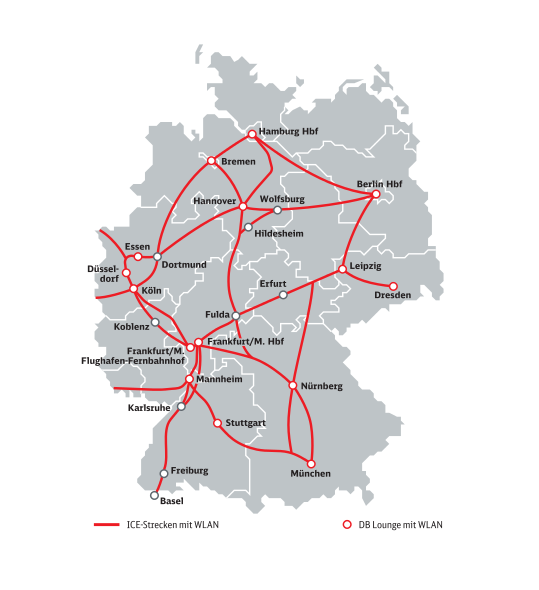 Browse other questions tagged trains germany wifi high-speed-rail deutsche-bahn or ask your own question. Can you do a phone call or telconf through Skype or Google Plus when traveling on the ICE in Germany?